I didn’t plan on writing another post so soon, having just finished a weighty one two days ago. 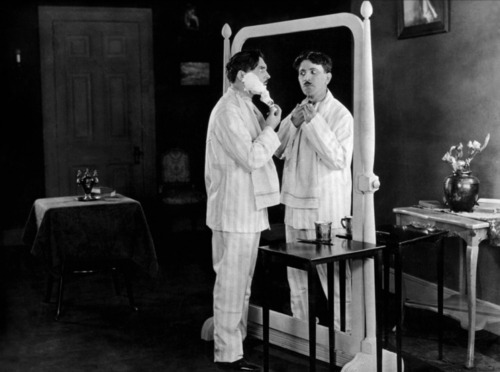 But I can’t let a weekend slip by without telling you about Max Linder. It’s my obligation. You may know the name. Linder was a Frenchman; a stage comic who entered motion pictures before 1910, becoming a director, screenwriter and big, big star. He established the model his successors would follow: a stock character, distinctively his own, returning in film after film. The master didn’t make many feature films. Linder’s life, which ended in 1925, was terribly tragic—not least because he died in the middle of the greatest decade in the history of filmed comedy. Max would have made it greater. I’ve written that Roscoe Arbuckle, had he been allowed to continue working, would have been silent comedy’s “fourth genius,” alongside Chaplin, Keaton and Lloyd; after watching Seven Years Bad Luck, I think Linder could have been the fifth. Story-wise, Linder’s Seven Years Bad Luck is basic, even by slapstick comedy standards. 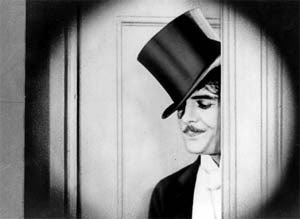 Linder, playing a wealthy man named “Max Linder,” offends his fiancé and decides to take a trip to clear his head. But it’s all in how he gets there. The film is a bunch of big gags: each so self-contained that you could show them as standalones and they’d still work, but each greater here, together, because one causes the next, and all are rooted in who “Max” is, inside. They exist as part of a logical progression. Because of this, Linder achieves a narrative flow in Seven Years that a lot of clowns never did, in anything. Consider the second half of the film, which features Max on the run, pursued by cops. Max hopped a train without a ticket, that’s why they’re after him. But Max is wealthy, so why would he need to? It’s because earlier, at the train station, he was accosted by a mugger. No, he wasn’t mugged—he was threatened, and because Max is brave, he took off his jacket to fight back. The man he handed the jacket to was friends with the mugger. And so Max’s wallet is gone. Max is broke, not just because he was robbed, but because he is brave. The gags are thoughtful, and executed with discipline. Especially the one where Max stands before an empty mirror frame while a servant, dressed to resemble him, mimics his gestures. Though this bit is today associated with Duck Soup, I think Linder does it even better than the Marx Brothers. Linder tackles head-on the problem with the gag: the fact that no one looking into a “mirror” this way could be fooled, even for a moment. His establishes, first, that Max has just woken up from a very late night; he’s bleary-eyed and probably still drunk. And his servants, desperate to hide the fact they’ve broken the mirror, work together to maintain the ruse. It takes courage for a slapstick artist to face implausibility. Acknowledge it and you risk undermining everything else you do. Linder gets away with it here because he creates the right conditions. ‘Courageous’ describes the character too. Max’s Max is more of a man’s man than most clowns. There’s that fist-fight with the mugger, for one thing; and the internal strength it takes for Max, rejected twice by his high-strung fiancé Betty (Alta Allen), to step back and plan a trip to clear his head. His toughness and wit are merged when he accidentally superglues his hand to a woman’s outfit, then must hide this fact from her father, even while he’s tearing her dress completely off. Max even evades the cops by climbing into a cage filled with big cats. Deliberately. I thought of Odysseus. Is that too much? A brave and clever man, trying to get home, facing many challenges along the way… waiting for him, hopefully, is his true love. Watching Seven Years Bad Luck is so satisfying—it’s like eating a really good trifle. And I could go on about it. 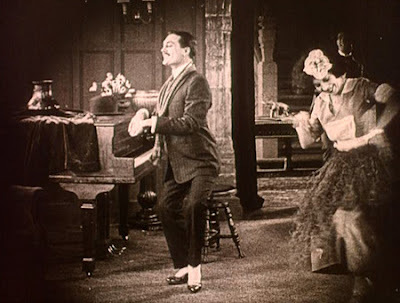 I could tell you about the dance sequence that gets Max in trouble with Betty in the first place—one of the few examples in silent film of a scene that “feels” like a musical number. Or Max’s surrealist dream: reconciling with Betty while nymphs rise out of sod-mounds in a great lawn. I’m still trying to puzzle that one out. But enough. I have errands to run, and you have a movie to watch. Seven Years Bad Luck is available on Image Entertainment’s Laugh With Max Linder, a single disc that includes the feature film along with several of the master’s shorts.